Delicately lovely, dark-haired and innocent-looking Sonja Ziemann (1926) is a German film and television actress, singer and dancer. 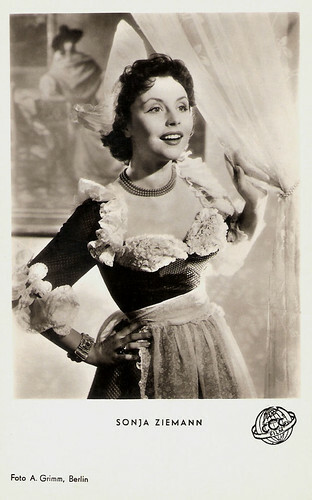 Her roles in Heimatfilms and Operettas as Schwarzwaldmädel/The Black Forest Girl (1950) and Grün ist die Heide/The Heath is Green (1951) made her one of the first stars of Germany's post war cinema. Her private life knew several tragedies. 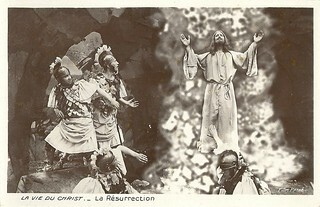 French postcard by Edition P.I., Paris, no. CK-238. French licency holder for UFA, Berlin-Tempelhof. Photo: Klaus Collignon / UFA. German postcard by UFA, Berlin-Tempelhof, no. CK-56. Retail price: 30 Pfg. Photo: Arthur Grimm / UFA. Sonja Alice Selma Toni Ziemann was born in Eichwalde, near Berlin, in Germany in 1926. Her father was a tax consultant. At age 10, Sonja began to train in ballet and from 1939 on she studied at the ballet school of Tatjana Gsovsky in Berlin. 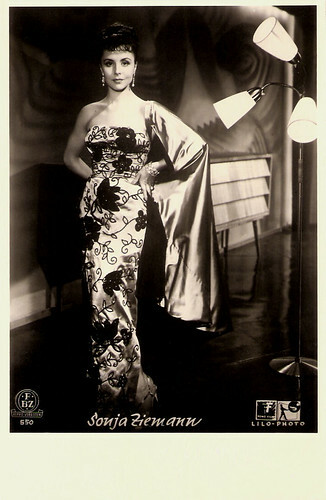 She made her stage debut in 1941 at the Plaza variety Theater, and appeared in several revues. Her film career started a year later and during the war period she played supporting parts in films like Ein Windstoß/A Blast (1942, Walter Felsenstein) starring Paul Kemp, Eine kleine Sommermelodie/A little summer melody (1944, Volker von Collande) and the horror comedy Spuk im Schloss/Ghost in the Castle (1945, Hans H. Zerlett) starring Margot Hielscher. After the war, she appeared in cabarets and worked together with Hildegard Knef, who became a lifelong friend. At the Metropol-Theater in Berlin, she had her first successes as a soubrette in such operettas as Die Zirkusprinzessin (The Circus Princess), Nächte in Schanghai (Nights in Shanghai), Chanel Nr. 5 (Chanel No. 5) and Die Kinoköniginn (The Cinema Queen). The lead role in the Heimatfilm Schwarzwaldmädel/The Black Forest Girl (1950, Hans Deppe) starring Paul Hörbiger was her breakthrough in the cinema. 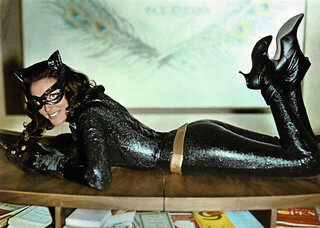 The public loved her mix of naivety, simplicity and good humour. The following year she had another huge hit with the film operetta Grün ist die Heide/The Heath is Green (1951, Hans Deppe) with Rudolph Prack. She won the Bambi award that year, for the most popular German star. For a while she and her film partner Rudolph Prack were one of the great Traumpaare (Dream Couples) of the German cinema, and they were lovingly nicknamed Zieprack. German postcard by Kunst und Bild, Berlin, no.A 813. Photo: Arthur Grimm, Berlin / CCC-Film. 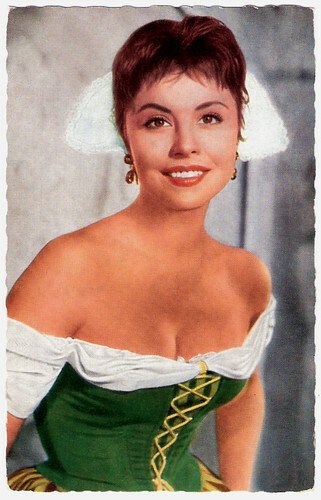 Publicity still for Hollandmädel/Dutch Girl (1953, J.A. Hübler-Kahla). German postcard by Kunst und Bild, Berlin. Photo: Pontus Film. German postcard by FBZ, no. 550. Photo: Lilo-Photo. German postcard by Ufa, Berlin-Tempelhof, no. FK 4776. Retail price: 25 Pfg. Photo: Grimm. Sonja Ziemann’s career changed direction with her serious role in the German-Polish post-war drama Der achte Wochentag/Ósmy dzien tygodnia/The eighth day of the week (1958, Aleksander Ford) with Polish idol Zbigniew Cybulski. The film was based on a story by Marek Hlasko, who later became her second husband. IMDb writes that it was “the record-breaker among Polish films shelved by the government censors. It waited 25 years for its Polish premiere. The reason for that was the pessimistic look at housing problems in 1950's Warsaw.” This role was followed by parts in the serious dramas Hunde, wollt ihr ewig leben/Battle Inferno (1958, Frank Wisbar) starring Joachim Hansen, and Nacht fiel über Gotenhafen/Darkness Fell on Gotenhafen (1959, Frank Wisbar) with Erik Schumann. 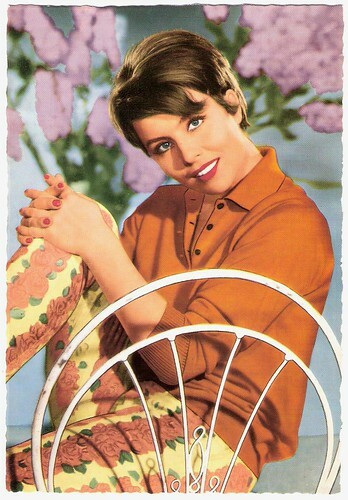 Her later films included the all-star drama Menschen im Hotel/Grand hôtel (1959, Gottfried Reinhardt) and the title role in the musical comedy Der Traum von Lieschen Müller/The Dream of Lieschen Mueller (1962, Helmut Käutner). She also played in American productions like the Alistair MacLean adventure The Secret Ways (1960, Phil Karlson) with Richard Widmark, and the war film The Bridge at Remagen (1969, John Guillermin). Ziemann was married three times. Her first marriage was with stocking manufacturer Rudolf Hambach from 1952 till 1956. They had one son, Pierre. 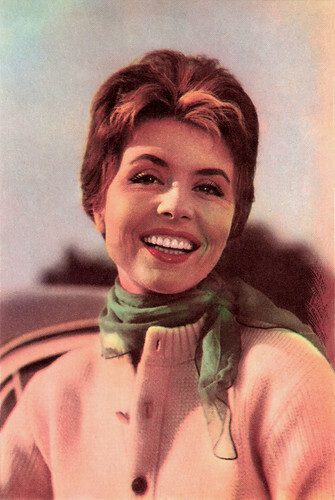 In 1962 she married the Polish writer, Marek Hlasko. From then on she mostly appeared in the theater and she was also regularly seen on TV. Tragically her second husband committed suicide in 1969. Just seven months after the suicide of her husband, her only child, Pierre, died of cancer at the age of 16. In 1974 followed another drama, when her constant companion, Martinius Adolff, perished in an airplane crash. Ziemann was good friends with Pamela Wedekind. Three years after Wedekind's death, she married her husband, French actor and director Charles Regnier. Regnier died in 2001. In 1984 she was honoured with the German film award Filmband in Gold and in 1998 she had published Ein Morgen gibt es immer. Erinnerungen (There is always a tomorrow. Memoirs). Sonja Ziemann lived for a long time at the Tegernsee, a lake in Bavaria, and in Switzerland. IMDb notes that she lives now in a house for assisted living in Munich because she did not want to live alone in her big house at the Tegernsee. German postcard by WS-Druck, Wanne-Eickel, no. F 168. Photo: CCC. German postcard by Kolibri-Verlag G.m.b.H., Minden (Westf.). Retail price: 25 Pf. Photo: CCC / Schorchtfilm. 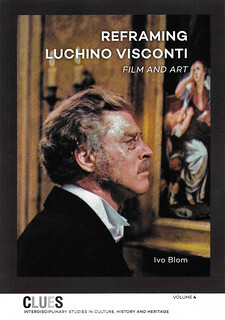 German promotion card by Lux. Belgian postcard by Cox, no. 33. Sources: Filmportal.de, Haus der Geschichte (German), Wikipedia (German and English), and IMDb.